The simplest 3D curve is a 3D Curved Segment. 3D Curved segments are always oriented along z axis of the current object . z-coordinates of its ends are knots of the current object. Another necessary property of a 3d segment is that its projections to z, x and z, y planes are arcs or straight lines. A 3D Curve is a strip of joined 3D Curved Segments. Any 3D Curve in a given 3D Object consists of n-1 3D Curved segments, where n is the number of base knots in the Object. Active 3D View. 3D Curve with two Curved Segments and three base knots. In our definition of a 3D curve we include 3D lines too, considering them as a special case of a curve with zero value of curvature. Edges of 3D surface patches are 3D curves. 3D curves can also exist as a standalone curve. Standalone curve is a Generic 3D Object. It has its local frame. A standalone 3D Curve can be created with the New Object dialog (Model menu>New Object>Curve) or by deleting an edge from a single surface patch (See Delete command). A standalone curve can also be moved as an object in 3D by using Current Object Page. Its color can be modified by using Color page of Options Dialog available on "Current Object">Options menu command, like any other object. 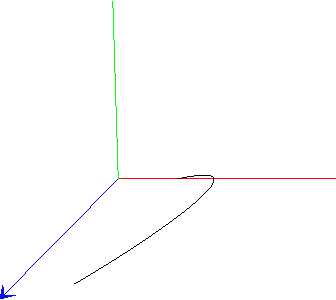 3D curves can be edited in 3D Debugger either by modifying its cross-section or its projections to x, z and y, z planes (See Cross Editor and Profile Editor ). 3D Curve elements can be defined either in Cartesian or Cylindrical Coordinates. 3D Curve properties dialog allows changing type of the coordinate system. Note that changing the type of the coordinate system generally will change the shape of the curve. More precisely, points at axial knots will remain the same but the middle part of the curve segments will be approximated to best fit the previous shape. The Cylindrical Coordinates of a point are defined by distance to z axis (Polar Radius), angle of projection to x and y plane with x axis in degrees and z coordinate. The term Polar Radius is used because at each cross-section the first two Cylindrical coordinates coincide with two dimensional Polar coordinates of the cross-section point.